Welcome to rock and roll summer camp. Being “one of the guys” isn’t necessary here. Neither is knowing how to play a guitar, drums or bass. You don’t need to know what an XLR cable is or how to set up a drum kit. You will learn these skills though, and you don’t need to worry about looking like a sexpot while doing so. In fact, you really shouldn’t. If you’re at this summer camp, you’re probably a teenage girl. And you’re here to learn how to be in a rock band. During Denver’s sixth annual Girls Rock summer camp in July 2014, a guided visualization and meditation helped ease campers’ stage fright before the week’s final live music showcase. While some campers calmed their nerves with visualizations of “riding a unicorn with Jack White,” others just wanted their moms. For others, what was needed before hopping onstage was the comforting words of their bandmates. The showcase would be the premiere of the campers’ singing, songwriting, instrumental, rock goddess abilities in front of their friends, families and teachers. Naturally, some of these campers had pre-show jitters. Learning how to deal with stage fright is only one element of the intensive weeklong summer camp. Other tidbits include scream circles, ‘zine making, female music history and appreciation lessons, learning a new instrument, and songwriting lessons. The campers also get to form their own bands and spend the week making music with each other. 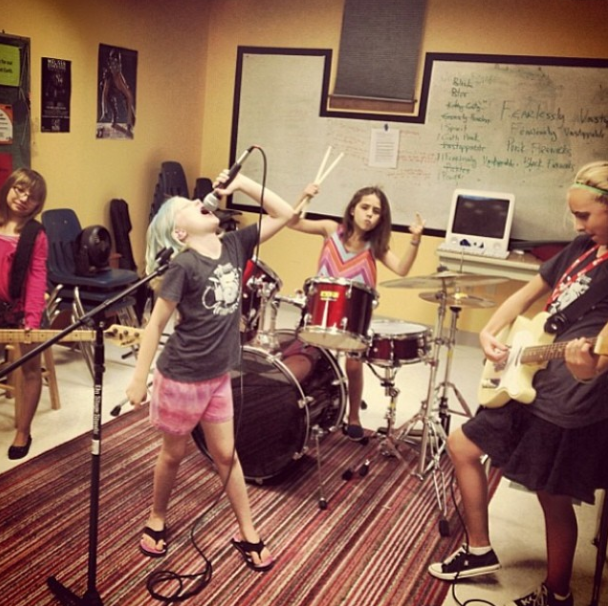 Girls Rock Denver 2013 campers rock out at band practice. Photo courtesy Jordan Beyer, @girlsrockdenver Instagram. According to 14-year-old Girls Rock Denver camper Reece Pierce, the camp isn’t just about making music. It’s a confidence-boosting, life-changing experience. Reece is a drummer who has been attending Girls Rock every summer since she was eight. Girls Rock is an important art of the Pierces’ lives—her mother, Kendra, is the volunteer “camp mom,” and her father and brother volunteer during the showcase as well. She doesn’t plan on quitting camp anytime soon. “Over the course of the years that she’s been in the camp, it’s helped form her,” Kendra Pierce says. Fueled by donations, a group of friendly volunteers’ unused vacation hours, and a love of music and community, this is a week that’s way more than a little classic DIY grrrl rock. Girls Rock may sound like another fun, inspiring camp to send one’s daughter during the height of summer boredom, but the bigger picture rests in the camp’s tagline: “We Believe: Potential is not dictated by gender.” Why would it be, though? Kearney cites today’s popular mainstream female musicians, women such as Taylor Swift, who have instrumental talents, vocal skills and voices in the media, but are still boiled down to sexualized bodies, faces and last but not least, vocal talents. Girls Rock Denver 2014 campers hard at work. Photo courtesy @girlsrockdenver Instagram. Kearney explains that girls today are making more media than ever before. With the popularity of social media like Youtube, Facebook and Twitter (and more recently Snapchat, Instagram and Vine), photography, filmmaking, music and web production are at the fingertips of young, middle class women around the world. However, production techniques are often viewed as “hobbies,” and are rarely transferred to the workforce for many young women. “I can only think of this as analogous to the film world, in terms of: women and girls think that the only role for them within the film industry is standing in front of a camera. They rarely think of picking up a camera and shooting it themselves, even though every middle class girl today has her own phone and is taking pictures all the time,” Kearney said. The original Rock ‘n’ Roll Camp for Girls began in Portland, Ore., in 2007. Since then, 43 spinoff camps have been created around the world, including Ladies Rock camps for adults. The proceeds of the adult camps help fund Girls Rock campers whose families can’t afford their daughters’ $300 camp tuition. In Denver, Heather Dalton and Ginger Richards Conly— former female rockers themselves — volunteer as band coaches and instructors. They mentor campers throughout the week, and work with the girls through any differences and conflicts that inevitably arise between bandmates. 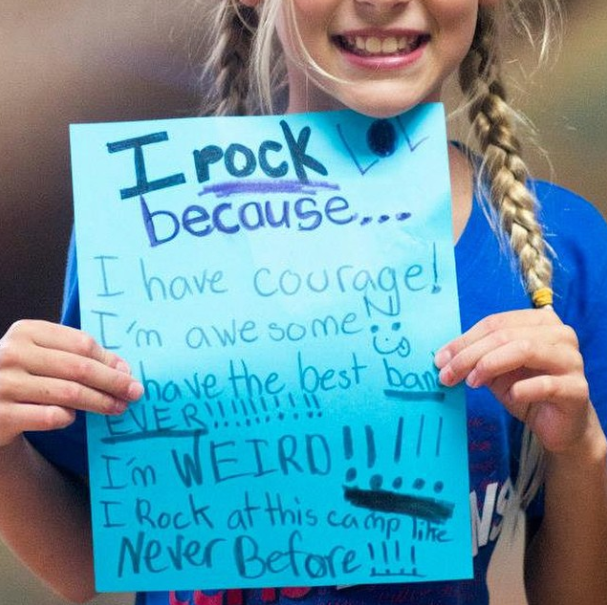 Girls Rock camps offer a safe space for girls to not only be themselves, but to learn and interact without the multitude of distractions offered by less-than-friendly peers, negative self talk, and most importantly, the media. The combination of sexualized female images filtered through “you can’t” language in mainstream media often affects girls by age 12 or 13, explains Dalton. “Letting girls feel comfortable in their own skin” is a big part of Girls Rock’s mission, Conly said. Reece explains that while she’s typically an introverted student in school, Girls Rock has been a place where she’s learned through workshops, mentors and her fellow bandmates and campers that it’s good to be herself. “There are a lot of workshops that kind of build of your mojo and self-esteem, so it’s like, you’re a great person and we’re gonna show you why,” she said. 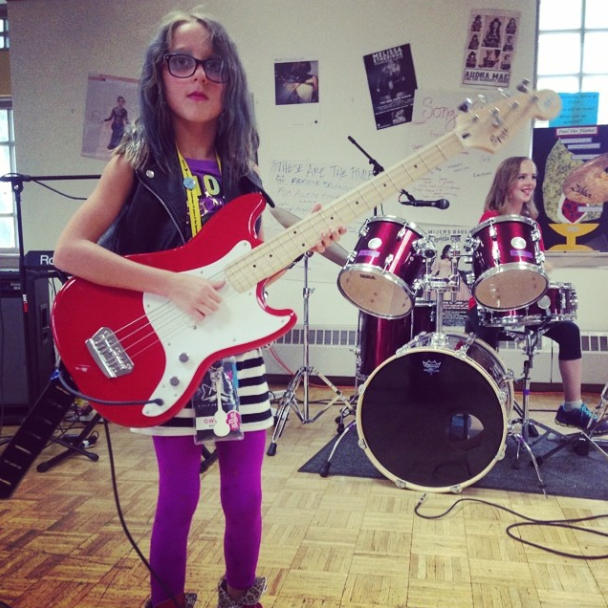 Girls Rock Denver not only builds music skills in its young rockers, but self esteem and camaraderie. Photo courtesy Alicya Tebo 2014. According to a 2008 survey commissioned by the Dove Self-Esteem Fund, seven out of ten girls between ages 8 to 17 believe they’re “not good enough or do not measure up in some way.” Additionally, 23 percent of girls don’t feel confident enough to raise their hand in class, according to the Dove survey. Forty-seven percent of girls surveyed named body image as their number one concern. These numbers aren’t skewed to sell soap to girls with low self-esteem, though. A 1991 study by the American Association of University Women found that in elementary school, 60 percent of girls surveyed answered that they felt “happy the way I am.” By high school, that figure dropped to 29 percent. Thirteen-year-old Arabella McClure is a guitarist and vocalist who started attending Girls Rock Denver when she was eight years old. She said she’s come a long way since her first year on stage at the camp. “They asked me if I needed the lyrics onstage. I said I didn’t, but once I got up there, I couldn’t remember the lyrics. I had to improvise until the chorus,” Arabella said. Arabella says the lessons she’s learned through Girls Rock such as stage presence and self-empowerment have not only helped onstage, but in everyday life. “I’ve become a more confident person and it’s made me want to do music more,” she said. A rise in the availability of independent music via the internet has meant artists can take control over their image and branding, explains Kearney. By using the web to do everything from selling music and merchandise, booking tours, crowdsourcing, streaming live concerts online, using social media to promote upcoming shows and connect with fans, Colorado musicians say they juggle two jobs in the independent music industry: musician and entrepreneur. Katherine (Kato) Kronen is a 26-year-old drummer and clothing designer from Boulder, Colo. Along with her younger brother Caleb and bandmate Chris Wright, the three form Kronen, an experimental electronic rock ensemble. Kato sings and plays drums in the band. She also produces the band’s records with Caleb. Kato said that although overall reactions are supportive, both men and women “are in awe” over the fact that she’s a female drummer before considering her musical talent. In summer 2014, VICE Media’s electronic music and culture channel THUMP estimated that less than 10 percent of electronic dance music festival lineups across the United States included female artists. Kato says that while this figure is unsettling, it’s not surprising, and it puts her in a position of power. She has a duty to play as a positive role model for other young women in music. Along with drumming for the band, Kato also designs costumes that she hires female friends to model during Kronen’s concerts. Kronen performs at Denver’s Bluebird Theater in October 2014. Photo by Lauren Maslen. 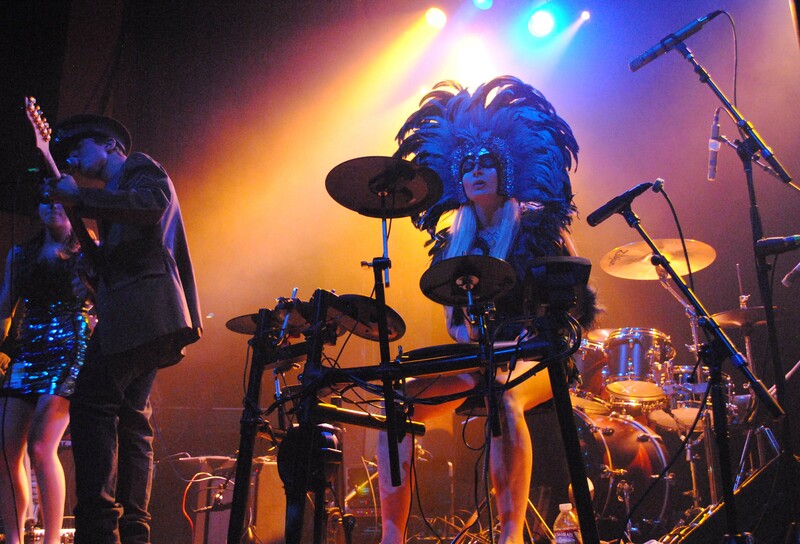 Kronen’s Halloween 2014 show at Denver’s Bluebird Theater featured Kato and her model friends flaunting the drummer’s handmade bird costumes around the venue. It’s a type of performance art that Kato said not only boosts the women’s confidence, but has also contributed to Kronen’s success. “I feel like music isn’t enough, especially nowadays with how hard it is to get by in the music industry. You have to be really creative to make a living,” Kato said. Kris Drickey of Denver band Chimney Choir echoes this sentiment. “People’s eyes tend to gravitate toward the woman,” said Drickey, and as the only female in a five-piece band, Drickey said she is often the main visual centerpiece during live performances. As someone who usually shies away from the center of attention, this is a role that aims a magnifying glass directly on her. It can be used in fun and creative ways, Drickey says, letting her take advantage of a feminine role with costumes and makeup in performances and band videos. In November Chimney Choir ended an Indiegogo campaign to fund the band’s upcoming full-length studio album which Drickey said involved “psychedelic, cosmic shows” and “crazy, fun outfits.” The band is also producing Boomtown, a full-length ballet for Denver’s Wonderbound, and scoring the soundtrack to a feature-length documentary about Colorado sheepherders by Yuri Chicovsky called Sage Country. Unorthodox projects aren’t uncommon for independent Colorado musicians. In winter 2014, Fort Collins musician Danielle Anderson of Danielle Ate the Sandwich fame scored the music for the Colorado-produced documentary film Packed in a Trunk: The Lost Art of Edith Lake Wilkinson, and recently started playing live concerts through an online concert platform called StageIt. 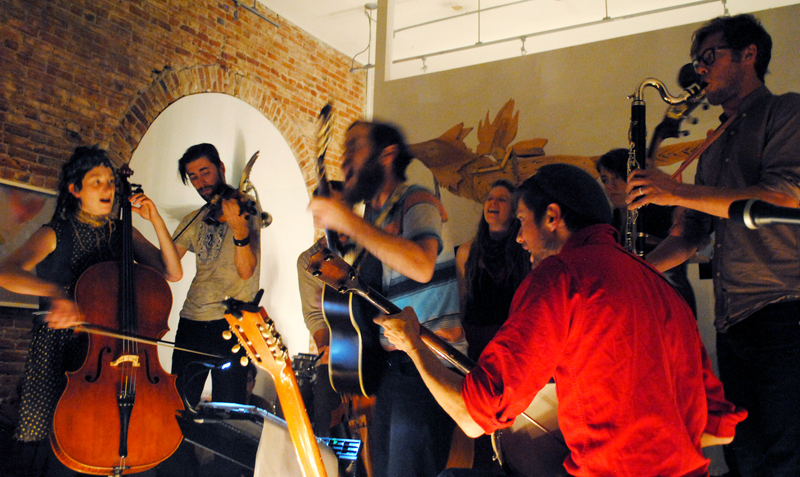 Other local artists, such as eight-piece musical collective Spirits of the Red City, merge their classically trained musical talents to play live performances in art venues across North America. Spirits of the Red City at Denver’s Leon Gallery, December 2014. Photo by Lauren Maslen. 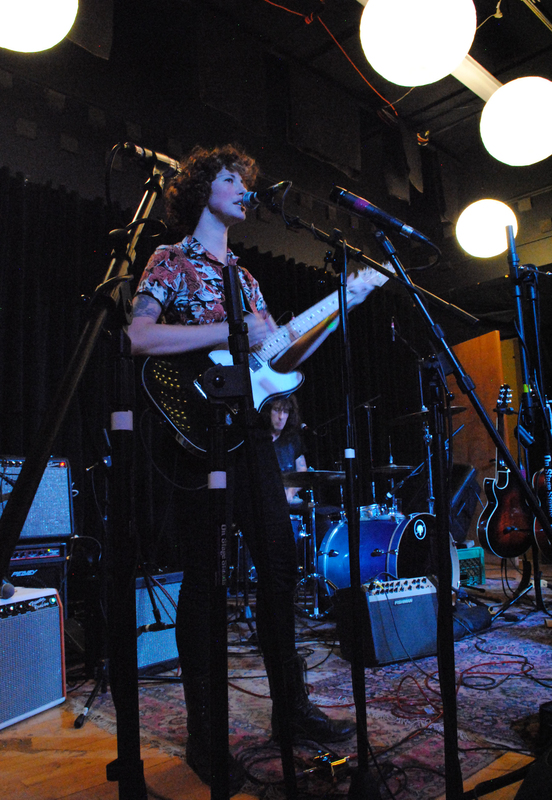 There is “more balanced feminine and masculine energy in the subculture of independent music than in the mainstream media,” Alyssa Overby of Spirits of the Red City said. “Women’s role in music has always been more limited compared to men’s,” Colorado Music Hall of Fame rock historian George Krieger said. Krieger cites women like folksinger Judy Collins as strong role models for Colorado’s folk music backbone. As far as the Colorado music scene goes, Krieger says female musicians “were just their own people; they were their own performers.” Colorado’s female musicians have always played a different game than the mainstream music industry. They relied on the message in their music and did not focus on sexual appeal, explains Krieger. Despite its defining political motives, the term “feminism” has never been without its critics. While today’s current media culture touts pop stars such as Taylor Swift and Beyonce, who declare feminism’s societal importance “in style,” the feminist movement still faces harsh criticism and controversy. Whether a world famous musician or an independent artist in Colorado, declaring oneself on one side of the feminist spectrum or the other can mean taking a political stance. That’s not what all musicians or professionals in the music industry set out to do; however, as women working in the male-dominated music industry, doing one’s job can inadvertently put a person in such limelight. Whether male or female, and whether or not they choose to use the word “feminism,” when asked about the subject, the message among Colorado artists is unsurprisingly the same: females and those identifying as female in the music industry deserve the same amount of respect, the same workload and the same recognition for their jobs as their male counterparts who historically have played much more visible roles in the industry. Unavoidably, children of all ages are consumers of media — media that send convoluted, mixed messages to all viewers about what’s “right” and what’s “wrong.” Media consumers of all ages and genders are told what they should and shouldn’t be doing, saying, buying, wearing, watching, listening to and eating. It’s easy to get caught up in media hype, especially considering some statistics. According to a 2010 study by the Kaiser Family Foundation, the average 8- to 18-year-old spends 7 1/2 hours every day consuming media. In such technology-saturated cultures, girls and all young people need positive influences and role models. When it comes to all-female workshops and festivals, opinions vary around the Colorado art and music scene on how much good female-focused events are really doing for their cause. While some artists, activists and festival creators think fem-based events are a blessing, others think they create more obstacles in the way of equality. Emma Back, a Naropa University-trained musician and the founder of She Sings Out Loud (SSOL), holds a different opinion. Back’s SSOL workshops cut past the imposed “shoulds” and “can’ts” she says females especially experience and that hold them back throughout their lives. Such limiting language is what keeps women from the full expression of who they are in art, music, and in their lives, says Back. Her workshops teach women vocal training techniques, stage presence, how to deal with difficult sound guys, connecting with an audience, and how to work with writer’s block and stage fright. Back recently traveled to Israel to work with Palestinian and Israeli women who sing in choirs together. Studies show that choirs that sing together synchronize their heart rates and breathing patterns. It’s a quiet but poignant protest movement, which Back says forms unspoken communal bonds between singers. Other Colorado-based female music and art festivals, such as Denver’s Titwrench Festival, which also hosts a sister event in Stockholm, Sweden, promote alternative arts, community and learning through a female-based environment. Titwrench Festival founder Sarah Slater explains that we live in a patriarchy, and as long as that is the case, a festival like Titwrench is still relevant to local artists. Along with film screening, live performances, art and networking, Titwrench Festival includes education and technology workshops in its three-day lineup. Classes like the annual microphone-building workshop sell out every year. Titwrench 2013 promo produced by Kim Shively, courtesy Sarah Slater. Colorado-based musician Esme Patterson has her own take on the issue of all-female events. “I feel like I’ve swung back and forth. Sometimes I bristle at the distinctions of ‘let’s do a festival of all females, or all women.’ It [gender] should just not be part of the conversation,” she said. 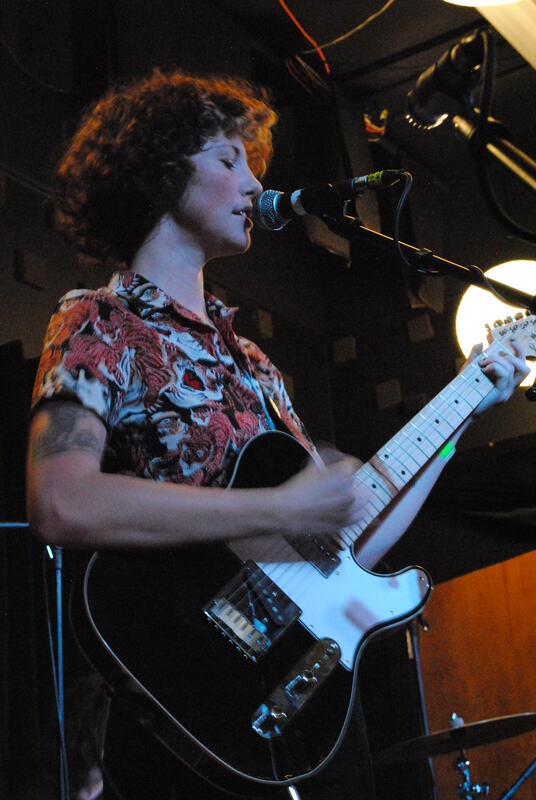 Esme Patterson plays Colorado Springs’ Ivywild School in December 2014. Photo by Lauren Maslen. Patterson is signed with the Denver-based independent music label Greater Than Collective. Erin Barnes is Greater Than’s publicist, and as the only female staffer for the small record label, she explains that the current independent music industry is “kind of like the Wild West” in that there are no textbook rules to follow. “You need to have the confidence to just make stuff up as you go — fake it ‘til you make it — while also having the sensitivity to pay attention to invisible norms,” Barnes said. Patterson does write her own music, she said, and music for other people. She also takes part in the local Denver music scene. In March Patterson auctioned off the dress she wore on the cover of her album Woman to Woman, donating the winning bid of $250 to Girls Rock Denver.